In a recent NYT op-ed, Northeastern University researcher, Dr. Lisa Feldman Barrett suggested something that made me realize that our brains are wired to profile. But those who seek to curb racism by curbing profiling seem misguided to me, especially when our brains are wired to subconsciously profile. This is probably why so many people rolled their eyes when a law was pushed through in New York City prohibiting the running of credit checks on job applicants. As justification, in part, advocates pointed out that the percentage of people with scores of 700 or above is less than half among blacks what it is among whites. A recent Illinois study found that the average credit score in minority neighborhoods was 107 to 130 points lower than in other neighborhoods but so was the percentage who made late payments, by three to six times. Poverty is more likely the cause than racism. Of course, I agree that bad credit should not be used to disqualify a candidate before allowing them an opportunity to explain. A check of existing employees in most workplaces should be enough to warrant credit counseling as a benefit. On a related subject, an excellent investigative report in Mother Jones this month incorporates research done at the Pacific Institute for Research and Evaluation. 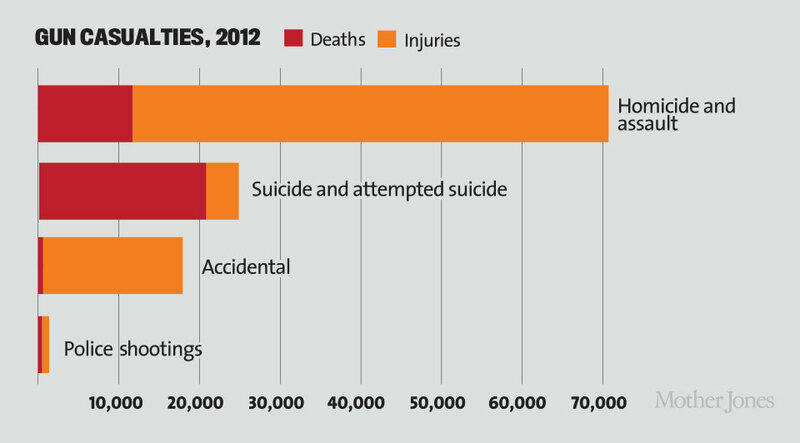 It documents the horrific cost of gun violence, $229 billion each year. Much of it, nearly $13 million a day is passed on to taxpayers. To put this in perspective, this will soon eclipse the cost of smoking on society. The report points out that while 93% of gun suicide victims are white, 57% of gun homicide victims are black. So are the majority of offenders according to FBI statistics. In a separate but related piece, the researchers point out the huge disparity in the percentage of homicides solved when there is a white victim compared to case involving black victims. Police shootings are a tiny sliver of the gun violence in America. Based on the way our brains work, it makes sense that they will concentrate resources in minority neighborhoods on behalf of minority victims, in pursuit of minority offenders. But essayist Tim Wise calculates from FBI data that only about 1% of African Americans including 2% of black males will commit a violent crime in a given year. It seems to me that profiling isn’t the problem nor is the use of statistics which can be a useful way of predicting crime. Racism is the problem and it is people who are racist.